שוין לאנג נישט אזוי גיט געזאגט רבי הערשעל !! "zechus of fighting in 1948 in the milchomo hakodosha of liberating our land"
"I am more Chabad today than ever"
Do these two statements go hand in hand? Learn the rebbe's true hashkofa regarding Medinas Yisroel before declaring yourself Chabad. Or am I the one who has got it wrong??? Good thing for the last sentences. This excuses Chabad???? huh? remember what Yoel Kahan said about the sun shining tommorrow..
You most probably forgot to mention that your post is (probably) a paid advertisement from the Agudah against the newly formed Peleg party, Welcome for importing the shac-aguda-peleg morass from israel to these United States. Don't mention it with friends like you who needs enemies, your "pain" is our gain! May I ask you hippo did Lubavitch "ever" participated in "any" Protest even when "all chereidim" went togheter! your credibility and opinion on this one is zilch. No wonder that Lubavitcher leaning cheridim are the most conscripted, your actions are being noted. can you define "leidek geyers" please, so once they will join the Army the won't be leidek geyers anymore! they will be useful as "fodder" in Napoleon's army. what is Rav Shechters problem? "protest on Coney island ave against the Shachter/Fruchthandler yeshivah"
No one forced you to join their "yeshiva" the IDF does!, is that thought behind your learning curve ? i feel bad for the guy who wrote that who wasted his life on the failed ideology of Zionism, but why is he blaming his confusion on Chabad? that is not Chabad's position. even his name will tell you that he's a case study in contrast deer/goat (hirshel/tzig) when he's neither one (perhaps a wolf in sheep's clothing), he's a Lubavitch'er Impostor. .. he will curse out The Rabbis Beck and Fulop for their courage to speak out and name them unspeakable names! But when that Israeli Michael Ron David Kadar y"m Terrorized litterly a 1000+ times the "WHOLE WORLD"! you won't hear a word from him or his surrogates a word. good point dovy, you see hirshel is not a zelot or anything else, but a necktie salesman who throws out a dozen mismatched ties on the counter and hopes to sell one, he forgot who he is or what he wants he displayed a smorgasbord of hate! and hopes you will bite the bait. !?!? "ואין אתנו יודע על מה" !?!? Israel’s army is recruiting ever more ultra-Orthodox officers. Rabbis who object to the recruitment of religious women, or of ultra-Orthodox men, are fighting a losing battle. National-religious Jews, who account for about 10% of the population, make up about 40% of junior and mid-level infantry officers. The IDF is one of the world’s most gay-friendly armies. Rabbi Aaron M. Schechter of MYRCB is not a Litvak. I was told that he is of Vizhnitz Hasidic roots. See how he does naanuim. Not like a Litvak. Instead of going straight around, דרך ימין, like a Litvak, ער שאקעלט אהין און שאקעלט אהער. I'm sorry but their was no dig'duk classes in our academy. The problem with this "convention" is that it's not a "Protest" but rather a platform manipulated shrewdly behind the eyes of the local organizer's to the benefit of an israeli party, "even that their cause of alarm is 100% urgent!". and they do it now more "overtly" so than the other parties manipulated the rather successful Foley Square Protest. A protest organized by satmar no matter the alliances or by them self's, they are good enough on their own!, should have at a minimum the platform of Foley Square protest. The danger of combining a protest with any "Israeli parties" outweighs the benefit of the protest. SR joined with the "Agudahs Harabunim" of NY to Protest but "not" with "agudas yisruel"!, By the mass protests in NY against "giyus bunis" (when all joint in unison), the Agudah had complained that the SR interactions with the Israeli gov. is through the Mizrachi and Not the Agudah. By the last mass protest the SR organized the leadership told him that more speakers want to speak than their is slots, the rebbe told them, tell each speaker that they must also talk against the state itself not only against the atrocity of the current gezira, and your problem will be solved..
and what does he say on voting in the national elections there, can you enlighten us on that? "No one forced you to join their "yeshiva" the IDF does!, is that thought behind your learning curve"
"SR joined with the "Agudahs Harabunim" of NY to Protest but "not" with "agudas yisruel"!, By the mass protests in NY against "giyus bunis" (when all joint in unison), the Agudah had complained that the SR interactions with the Israeli gov. is through the Mizrachi and Not the Agudah." Did SR have a shulchan urech for this stuff, ? yes and haman forced us to do t'shivu. "The IDF is one of the world’s most gay-friendly armies." A perfect place for OTD "leidek geyers" RC"L !!! But the skullener rebbe shlita will probably "abstain" from this gathering! why? don't ask.. and I won't tell. "Did SR have a shulchan urech for this stuff, ?" fa: "for this stuff, ?" Please share Rabbi Kahn's wisdom with us. Medinat Yisroel donated? Huh? Joe and Faye Tannenbaum workedb made money and donated it. Medinat Yisroel took money from workers and paid Charedim not to disturb them. They bought a product with their money. Holocaust Shmolocaust. You think you mention concentration camps and everything else you say is correct?! I thought Chabad had slightly more toichen than a magnet for morons like this email sender. ¶ Survey: Only 46% of Next Generation National "Religious" Israelis Keep the Faith. ¶ 17,000 Israelis have left the ultra-Orthodox world. 1,300 or 10% (OTD) is now predicted annually. ¶ More women than ever are joining Israeli army combat units. A new mixed battalion is taking shape. But problems remain, with hundreds of sexual assaults reported each year, and some refusing to accept women''s ability to fight alongside men.
! "איהר זענט דאך קלוגע אידן, לאזט זיך נישט אזוי"
NOW COMES THE REAL NEWS - Its ערלעדיגט all right ! "In 2014, the Israeli parliament voted through a law which will compel "all" ultra-Orthodox Jews to either serve in the military or perform national civilian service. The law also includes a clause stipulating sanctions against draft dodgers -- including imprisonment -- in a move which has enraged the ultra-Orthodox leadership who said it would be tantamount to jailing people for practicing their faith. A 2015 amendment "extended the transition period" before the law came into effect from 2017 to 2020 and added a second stage of transition to last until 2023." !!! The one eye goat: "I want to declare that we must protest "these people" for going against our medina". Bring it on Paul will be waiting for you instigators!, just a reminder the Barclay Center is not in the lawless Jerusalem! "these people" are protected by the Constitution of the United States of America, here in God We Trust. In 1950 Rabbi Issac Eichenstein Kiviashder Rav of Forest Hills, moved to the United States and settled in Forest Hills Queens, where he opened a Beth Medrash. In 1953, under the auspices of the Satmar Rav, he established the Central Rabbinical Council of the United States and Canada! equating chabad with zionism? hu? The sad fact is that this so called demonstration has nothing to do with the alleged so called forced drafting of yeshiva boys,it has everything to do with Satmar's irrational and pathological ugly hatred toward the Jewish state ,as the Rebbe himself writes in his anti-Israel manifesto "VAYOEL MOSHE" that our opposition to MEDINAS YISROEL is not based on the fact that it's leadership are secular and it's laws are not based on Torah and halacha,because even if the whole leadership would have been absolutely FRUM Jews and all it's laws based on HALACHA we would still be opposed to this illegitimate state as Jews have no right to ERETZ YISROEL and set up a government before the coming of MOSHIACH,and as a matter of fact the mere fact that we have now a MEDINAS YISROEL is an impediment to the GEULAH and is the sole reason that the MESSIAH has not yet arrived,and as long as the MEDINAH exists the GEULAH cannot happen.And the fact that we do have a MEDINA now with a KIBUTZ GALIYUS from all corners of the world with over six million Jews,and having defeated in all the wars the hundreds of millions of Arabs surrounding her and the fact that Israels accomplishments in the last 70 years is the envy of the whole world and the fact we have tens of thousands of young Jews sitting and learning Torah all day and being supported by the state-that is all the work of the SITRA-ACHRA (the devil) it has absolutely nothing to with HAKODOSH BORUCH HU but it is the work of the devil.could the devil himself come up with such evil obscene insanity ? including a million and a half young children. Unfortunately the minds of tens of thousands of Jews have been poisoned with this obcene hateful insanity,and this is what this demonstration is all about. Unfortunately the minds of tens of thousands of Jews have been poisoned with this obscene hateful insanity,and this is what this demonstration is all about. "against Reb Aron Kotlers view for the yeshiva world"
Since when is RAKs view for the yeshiva world binding on all other Yeshivos? His shitta was for his Yeshiva. Other Gedolim and Roshei Yeshiva were and are fit to decide as they see necessary. Tora Vodaas and Ner Israel allowed and allow their students to pursue degrees as well . Shall we go protest Rav Yaakov Kaminetzky, Rav Reuven Grozovsky, Rav Yaakov Ruderman, Rav Geldalia Schorr, Rav Pam, Rav Yaakov Weinberg, and Rav Shraga Feivelas Medelovitz as well? It is an absolute bizayon how RAS Shlit"a of CB has been getting pushed around recently. Due to his old age RAS now has some of his "mekuravim" taking advantage of him. It is the most detrimental thing that has happened to CB over the entire course it's storied history. The Yeshiva is being torn apart from within and most of the people that care are either too blind to see it happening or simply do not care. Regarding this asifa, see the FJJ page 8 spread to understand RAS position on the on-goings in E"Y. While RAS views this as a kinnus to daven for, and bring attention to, Bnei Toras in EY who will be drafted into the army, he does not realize that he being used as a pawn for Satmar's anti Medina propaganda. Back in the day, RAS would not have mixed himself up in such politics and would have realized that this asifa is simply an Anti Tziyoni rally by Satmar. "Rabbi Aaron M. Schechter of MYRCB is not a Litvak. See how he does naanuim. Not like a Litvak. Instead of going straight around, דרך ימין, like a Litvak, ער שאקעלט אהין און שאקעלט אהער." RAS has Hassidic roots too far back for him to have nurtured from them in any way shape or form. If you go back far enough all of us have some Chassidish roots somewhere in our family tree. But that does not make us Chassidish. RAS was an all American boy born in the good ole' US of A. His clean shaven father raised him a good American yingele without much of a trace of Chassidus. His Chassidishe hanhagos come from his Rebbe, Rav Yitzchok Hutner. RYH was as much Rebbeh as he was Rosh Yeshiva. His mother was from a Gerrer family in Warsaw and he learned Chassidus all his life. He famously learned Chassidus with the Lubavitcher Rebbe upon his arrival in America and maintained a relationship with several life-long Chassidishe Rebbe's. RAS inherited many of the hanhagos of his Rebbe and is well versed in sifrei chassidus and sifrei kaballa. Approximately 17 years ago, Rav Yaakov Meir Schechter attended a wedding in NY where he was seated next to RAS. After the wedding RYMS asked somebody (from whom I heard this story first hand) who RAS Schechter was and remarked "Ehr ken kol hatora kula, Nigla, Nistar, Likutei Moharan....". However, while RAS has inherited the hanhagos, he did not inherit the personality. RAS, with all of his hanhagos of a Rebbeh, is very much a Litvak at heart. The Chassidishe varmkeit, the Heimishe sense of humor and the Chassidishe inclination to neggina were not passed down from RYH to RAS.
" Rav Yaakov Meir Schechter attended a wedding in NY where he was seated next to RAS. After the wedding RYMS asked somebody (from whom I heard this story first hand) who RAS Schechter was and remarked "Ehr ken kol hatora kula, Nigla, Nistar, Likutei Moharan....". " "Yakov Mier Shachter was never in the USA"
I believe he was. For the wedding of a talmid's daughter. Approximately 20 years ago. Do you have reason or proof to believe that this is not true? I heard this story from a credible source whom I have always known to be honest. "Yakov Mier shachter does not know himself kol hatorah kuloi to vouch for others"
Obviously figurative speech and a guzma, not to be taken literally. Saying that somebody knows kol hatora kula is an expression commonly used to make a point of a person's gadlus b'tora. Nobody ever meant it literally, as it would be rather impossible for the person saying it, or it being said about, to actually know it all. Do you mind if I ask... What do you have against him? Why did you leave out his title and why are you looking to belittle him by trying to find fault in some casual words that he spoke? More details about the speakers and program at the upcoming asifah are needed to have an opinion. In the sefer that formed my view on Chabad, Al H'torah V'al H'Temurah, the most scathing comment about Chabad attributed to any godal was made becuase Chabad did NOT participate in the asifa against Giyus Bonos.
" 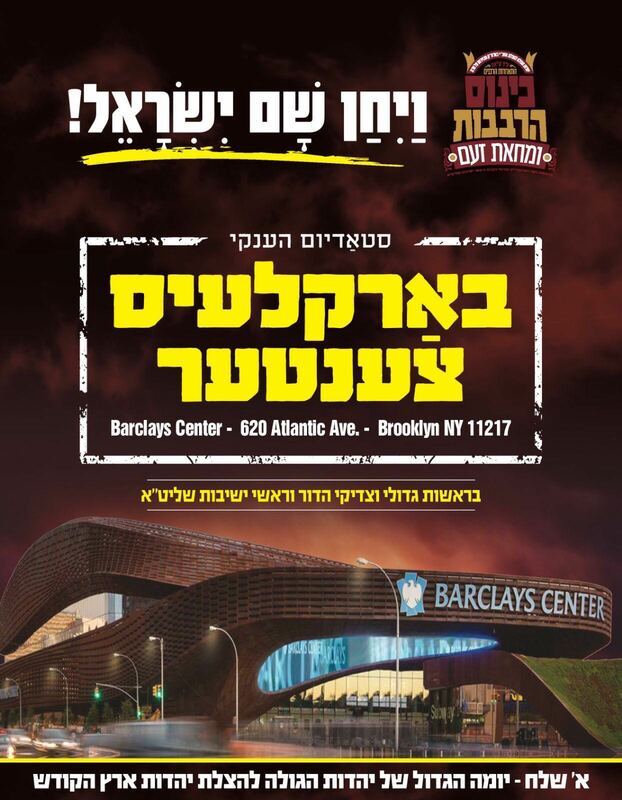 Al H'torah V'al H'Temurah, the most scathing comment about Chabad attributed to any godal was made becuase Chabad did NOT participate in the asifa "
Perhaps if the speeches will be given in English (or hebrew), or will flash the circus on giant screens, that he shouldn't attend. Q. when a new mamzer is born in town do we say mazel tov or what ? ..on the dark side of the moon. "צר לי עליכם, אחיי ורעיי"
"ער שאקעלט אהין און שאקעלט אהער"
reading this hate spewing post it feels like someone is trying to revive the infamous "Transylvanian Jewish News", well hate sells you never know, good luck with that.
" אויף דעם האט דער רבי גיזאגט (אין די קאר) לאמר: נישט דאס איז דער פשט; נאר וואזש'ע דען, לא תתגודדו עס וועט נישט זיין קיין "אגודה" דעמאלט ו'לא תשימו "קרחה למת" וועט נישט זיין קיין חטוטי שכבי, זיי זענען אלעס שולדיג." we boruch hashem have a powerful agudah and we dont have grave desecration..
"The news site Walla reported that the IDF last year saw at least 2,300 haredi "new recruits" a record, (Increase of 328) compared to 1,972 the previous year. A steady rise has been recorded over the past five years also in the conscriptiont of women, especially religious women ." A certain Galilean taught in the presence of Rav Ḥisda concerning this goat: When a shepherd is angry with his flock, he renders the goat leading them Blind! "וואך איין און וואך אויס טראמפייטערן די קעפלאך פון אייערע צייטונגן וועגן מערכות אהין און מערכות אהער"
A colossal success the satmars don't read those zitungin the don't need to its in their DNA really, but the anti-satmars it seems do read it weekly. thanks for reminding me (atleast I know where I'm). Just curious about the mechaber ha email:Why has this story made him "more Chabad than ever"?Ostensibly Chabad is anti zionist (though realistic as there is a Medina as a fact of life)Chabad not very big into Israeli flags (on their own initiative)AND bichlal this story has nothing to do with Chabad? Yo! : "Ostensibly Chabad is anti zionist"
submerged into Zionism with capital letters, don't flatter yourself. "Berliners still go to college against Reb Aron Kotlers"
and how many kotler'res wind up in college "through BMG outreach programs" after graduated from the BMG revolving campus. "as someone who was in front of the Beis Yisroel at 5:00am for tea"
How about me eating garlic motzei shabos passed midnight in Peshvorsk!, and/or drinking coffee in the "old bies medrish" in front of reb Pincus Rosenberg does it count as being a someone!? oh never mind it's just me, sorry. Chabad of today didn't "straddle" there struggle of "reality" vs. "theology" in RUSSIA ! they were very clear which paths is the right one, it took a lot of time and "pain" until that so called reality fizzled. there is no more U.S.S.R.
Zionism in essence is a failed ideology not unlike communism, yet chabad of today is clueless and totally submitted to the beast that's destroying them. With that repugnant statement he publicly alienated himself in the eyes of the anti-zionist cheridim, no reputable cheridi authority ostracized him/them. so hirshel in your new incarnation you will not post anymore "relevant" comments if its not according to your new reality? I'll get to old comments soon. I always do. a tzig-a-tzadig after the protest crowd won, he'll get to it.. I'm eyeing you for my 'rosh cheves' anyways. what has the Israeli reality to do with our american reality, does Siberia reality effecting the Miami reality, the Israelis who don't really like it should leave if they can, the reality is it will get worst for them not better. "could the devil himself come up with such evil obscene insanity ?" You will find out soooooner than later, he is waiting for you! to reveal himself chaim'che. First these nameless haters hate the NK's than satmars, then lubavitch'ers, now their own snag Rabbi's wchtfogel and shecter, these Hater's are nameless and leader less they have no tradition! no teachers to adhering to, they are the true blue HATER'S who just hate hate hate, with multiple names, and the source of all this innuendo hate? I better not disclose. I don't know if this site is accepted by the various "shmira filters" but if it is shame on them and on us to let go through such "blasphemy" on none other that the satmar rav z"l .
S: "Israelis who don't really like it should leave"
Benjamin Netanyahu’s government places the current number of Israeli citizens living abroad in the range of 800,000 to 1 million, representing up to 13 percent of the population. the most frequently given explanations for leaving Israel is: "The question is not why we left, but why it took us so long to do so". HT: "Sorry to take your time venting." 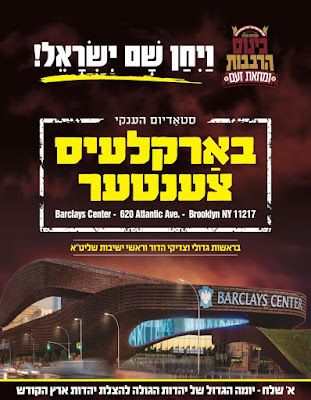 NEW YORK - Close to 20,000 Orthodox Jews gathered on Sunday at the Barclays Center basketball arena in Brooklyn to protest the Israeli law mandating Orthodox conscription into the IDF, which they described as “Israel’s persecution of religious Jews”. TOI: "Funding for yeshivas has reached an all-time high, following cabinet approval Sunday of a NIS 50 million ($13.5 million) "increase" in the yeshiva budget for 2017." ", when zalman sheizer president was in america the LR hugged and kissed him as was reported in the news with photos then, when he was asked about it, he replied as was reported: כל העולה לגדולה מוחלין לו כל עונותיו "
the Baal Hatanya( who had the zechiya that the mishneh berurah quotes him by name 400 times) writes in his sefer likutie amorim perek 32 (which by most Jews is not Nishtakcho, and bu most Jews all his words are choyim vekayumim, ) that Briyos (meaning the weaker element) you should pull them with thick ropes of love. So when you are not infested with the new religion of the veyoel moshe, and you have the opportunity to have influence on a president (a rosh hakohol) of Israel ( biggest kehila kedosha in the universe) you are obligated to hug a Jew with power of influence and kiss him to get a relationship going. In the holy Siget they had no problem to have kehila members mechalalie shabosim , if they did not fight the Orthodox kehila, everyone was welcomed.....I cant tell you who was hugged and who was not because we were nobody there. do you know the Chazal Kol Hamnavel piv.....? did you guys hear the speech in english from hagoan r' yakov Shapiro, he is even better than rabbi hertz frankel was, I don't think there were such a clear message explaining to the worldwide goyim the difference between judisim and the church of zionisim before. the rebetzin in gan eden must be proud of him. Shapiro sounds like some mobster from Bensonhurst. yuk. maybe when hirshel will decide to stop manipulate, and will post all relevant comments send here (not sleazy once only) than y'all will comprend a think or two. Adios. yes, but perhaps that's the language the mobsters from israel understands. בשיעור פרקי אבות בבית מדרשו בבורו פארק בשדרה ה-14 רחוב 49, סיפר הרב הורביץ למשתתפים שהיה עיר בה חיללו שבת ברבים והתכנסו רבנים מה לעשות, חלקם טענו שאין בכלל חילולי שבת, חלקם טענו שיש ולכן צריכים למחות בחילולי השבת ורב אחד טען שהוא יחבר "ווארימע ניגונים" (נידונים חמים. י"כ) ויכתוב מכתב המלצה, כשכוונתו על האדמו"ר מסקולען שידוע כמחבר ניגונים וכתב רק מכתב המלצה"
Reb Aron Titelbaum is being maligned by his sworn enemies for fighting for his fathers kovad from the kasahuer ruv and his family.his titelbaum heat went to his head and used some expressions on a old talmid chuchem that should never been used. Till today this sin is listed on his resume by the Zalonim side and every talmid of kashaer talmid knows he is obligated to hate Reb aron to death. The Skulener rebbe was the Tzadik hadoir and daas torah by the Zali side till Sunday, the irony was that he was considered a zali till now and used by his handlers to be part of a anti aroni camp. Lets hope his amolek move will gain him some new members in his dying enterprise. Shapiro got so much applause, he should put on a bekishe and shtreimel, move to Williamsburg, become a rebbeleh there, and farkoif his lukshen. Vi past es that such a kanoi should go dressed so modern? A shandeh. HT, start a campaign to buy him proper clothing as befits such a zealot. And for Jeremiah Cohen too. L: "the Zionist are forcing all the charadi boys to learn, otherwise you go the army.they should be commended for it"
typical luzer's if you can't kill the message, than kill the messenger. In the words of holy Satmar Rebbe I heard! "douche is what DUS does, a douche bag." it was a simcha ? or crocodile tears event? does he have a crown on the shtriemel? Did you say something bichlal?? There is nothing left to say, you just said it all. they claim 12,000 charadie boys are already inducted in the army, The number is larger then the number of all yeshiva boys, far Behiemas get men shtroi tzu esen...."
"Ultra-Orthodox schools in Israel are budgeted proportionately based on the existence of a “core curriculum” in civics, English, history, mathematics, literature, Hebrew and Bible. Schools that teach the full core curriculum receive 100 percent budgeting. The majority of ultra-Orthodox schools—known as “recognized but unofficial”— receive 75 percent budgeting based on the assumption of 75 percent compliance. Private schools, where no education-ministry oversight exists and no core curriculum is taught, nevertheless received 55 percent government funding. According to Education Minister Naftali Bennett, some 40,000 students study in such institutions." Shapiro used to dress more the part. His older shiurim online show him in an up hat. But I believe he now specifically doesn't dress that way so that his anti-zionist propaganda would be seen as coming from someone who is more mainstream/ moderate rather than from a right wing zealot in funny clothing. He is after all the media go to guy for them. Makes him look more normal. Shapiro is very calculating and cunning. Check out his you tube clips sitting and beaming with the kofer, Gilad Atzmon. You get seduced by the delightful possibility that your opponent will be eliminated. Politics is simply about moral superiority and personal destruction. "Hirsh ostracizing Feldman and Wachtfogel ostracizing Perlow etc." and you, are you circumcised ? "Private schools, where no education-ministry oversight exists and no core curriculum is taught, nevertheless received 55 percent government funding. According to Education Minister Naftali Bennett, some 40,000 students study in such institutions." "אין צי דברי מינות און כפירה וואס ווערט דא געשריבן "
can you decipher the kefira ? did someone say against the 13 principles? "אין די דברי ניבול אויף קדושים וטהורים אשר היה אתנו בחיים, "
please show the nivel against kedoshim??? this is all a joke and you idiot are repeating this nonsense "
I already established that your Phi Beta Kappa on jurisprudence you claim is fraudulent. But I would expect common sense atleast, If the Israelis report that there are around 17,000+ OTD "liedik geyers" (which means they where "on the derech" priorly) wouldn't that mean that the claim of 12,000 cheridim could possible be recruited is correct? common sense says so. "non-zionists, and anti-zionists" of Queens are Rallying! I feel your pain sergey. In the 1950s, a nineteen-year-old student at the Lubavitch yeshiva came for a yechidus to discuss his intention of going to college. More than three decades later, the then middle-aged man related to Rabbi Simon Jacobson the story of the encounter he had that day with the Rebbe. "I told the Rebbe that the reason I wanted to go to college was because I felt I had done my studies in Torah and I wanted to expand my horizons." He explained that he intended to remain a Chasid but hoped a secular education and college degree would help prepare him for a future livelihood. After the student concluded his presentation, the Rebbe responded, "Are you asking for an eitzah [advice] or for a bracha [blessing]? The young man, perhaps sensing the response that was coming answered, "I came in for a blessing." "A blessing with advice is always better than one without advice." The Rebbe than proceeded to tell him, "In my opinion, you shouldn't go. You should continue your studies in yeshiva. You will be matzliach [successful] and you can be a leader in the Jewish community with that." For the young man, the stakes were sufficiently high and he found it impossible simply to accept the Rebbe's veto of his plan. "How can the Rebbe tell me that when the Rebbe himself went to college?" "Precisely because I went to university, I know what it's about. I know the environment, and I think it will have a detrimental effect on you instead of a positive one." Seeing that the young man was still unconvinced, the Rebbe tried another track. "Can you draw a circle?" he asked. "Yes," the young man answered, presumably perplexed by the question. "Can you draw a perfect circle?" "No, I can't, not on my own." "What would you need to draw a perfect circle?" the Rebbe pressed. The Rebbe, whose interest in and aptitude for mathematics was well known, continued. "Tell me the difference between the circle you would draw on your own and the circle you would draw with a compass." "The circle I draw on my own won't have a sturdy center around which to draw borders, but the compass's center creates a perfect circle." The Rebbe then elaborated: "All knowledge you'll ever learn, every experience you'll have in your life, are the circles. They're not the center. If you don't have a solid center, you'll have jagged circles, incomplete circles, many different circles. I sense that you need that center before you start building your circles." When the man, then in his early fifties, related this story, he added, "I didn't listen. I went anyway." He started to cry softly. "And I still don't have a complete circle. I have many circles, this one, that once, incomplete." "Just because one person goes into a fire and comes out unhurt, doesn't mean that everybody should go into the fire." Telushkin, Joseph. Rebbe: The Life and Teachings of Menachem M. Schneerson, the Most Influential Rabbi in Modern History. Harper Wave, 2014. Pages 328-329. JP: you need that center before you start building your circles. No shtreimel! satmar needs a shabos 'goy' . Dr: "slaughtered by this mouthpiece.."
Don't blame the messenger he's just repeating what everyone else says.
" The Skulener rebbe was the Tzadik hadoir "
he should of course live to be 120. But I would choose different word's to describe the rebbe, perhaps with a little more perspectivism. Mind your own business stop slaughtering the Rabbis Shacter, wachtfogel, kotler, and on.. just because they stopped being the "mouthpiece" of the Agudas Yisruel whims.